Flickr wasn’t actually Flickr for very long. It launched in February 2004. It was acquired by Yahoo in March 2005. I had got my free Flickr account earlier in 2005. I enjoyed and admired Flickr as a great mix of content and community. Flickr ceased to be Flickr, not because it changed under Yahoo, but because it didn’t change very much. In 2017, Verizon acquired Yahoo, including Flickr. SmugMug acquired Flickr about a week ago. SmugMug? It’s another of “the oldest and biggest photography-oriented internet companies”. The quote is from Glenn Fleishman’s article at Fast Company. It looks as though Flickr is in good hands, for the first time in over a decade. So I’ll keep my Flickr Pro account for the next few months. For a while now, I’ve been taking photos with my phone, and not posting many of them. 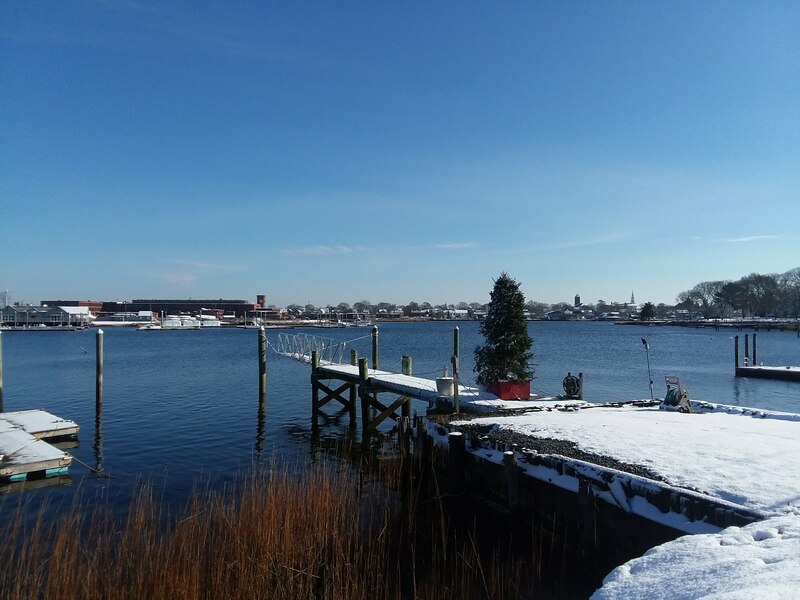 But I’ll post this one: boat dock in snow with Christmas tree. Later this year, I hope to have a camera, and an online home for my photos. I hope that SmugMug’s management of Flickr will be such that I don’t have to move the old ones, and just restart uploading and organizing the new ones I like. Who fumbled the web? That’s a question I’m asking, mainly at a site called Fumbling the Web. The story so far: if any one organization can be said to have fumbled the web, it’s Yahoo; but that would be a gross oversimplification. So, if FtW turns into a book, many chapters may focus on a single organization, and how it fumbled some aspect of the web. The post title was on the cover of Newsweek (with exactly that punctuation and capitalization, although I’ve changed such things elsewhere in this post). The issue was dated April 3, 2006. The cover showed the founders of Flickr, looking as happy as you’d expect given that Yahoo had just paid (an estimated) $35 million dollars for their business. Bradley Horowitz, then of Yahoo, sounded like a happy acquirer. [T]hey had millions of users generating content, millions of users organizing that content… people not on the payroll actually building the thing. Where on the Web? Wither Yahoo? What combination of web sites and services to use? This site–changingway.org–will remain my home on the web. The move to the new host–SiteGround–is complete. WordPress as Content Management System. Keen users of WordPress might want to check out the page on the choice and customization of the Twenty Sixteen theme. Google, for many services, including email. Facebook, a service I dislike used by a high proportion of the people I like. Yahoo, which deserves its own list of points. Should I, like millions of people, keep using my Yahoo email? Or should I, like many others, abandon it? Should I continue to use Flickr as my main photo site? I don’t think that Yahoo did much with Flickr after acquiring it. How will the Yahoo/Verizon deal work out? That’s enough, before I veer any further off topic. What combination of web sites and services to use? Author andrewPosted on March 2, 2017 Categories ChangingWay, Web, WordPressTags flickr, google, hosting, siteground, yahooLeave a comment on Where on the Web? Wither Yahoo? I took this picture in July 2009, when the young camera had just come to live with me in Boston. 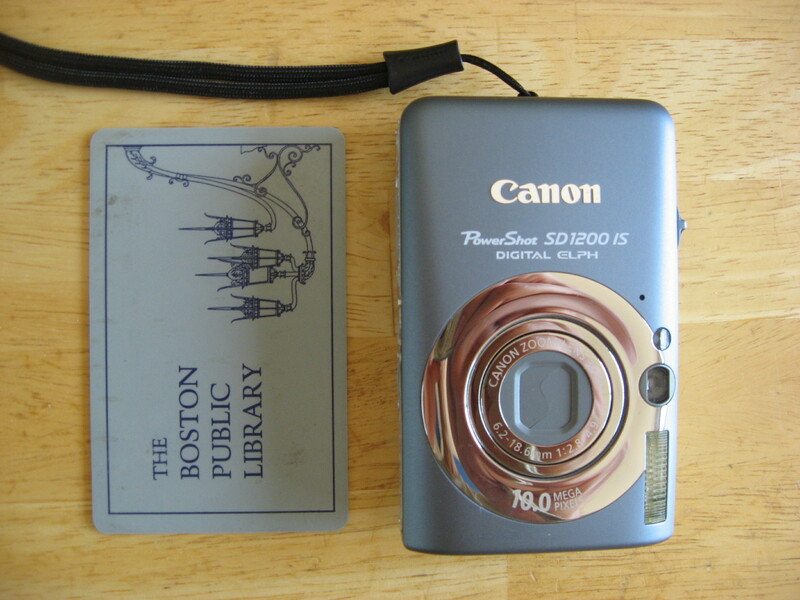 For five years, it served me well: the limit on photo quality was more often the photgrapher than the camera. It was very portable, and rather resilient. But it was not immortal. Its behavior became more and more erratic until, a couple of months ago, it stopped working altogether. What device (or devices) should I use to take photos for the next five years? The option with the lowest incremental cost is my phone, an iPhone 4. I know I’ll want something better than that as a camera, and probably soonish rather than later. But I haven’t done much with the photos I’ve taken this year. I haven’t looked through the photos on the deceased Canon’s card. My Flickr photostream has seen little activity. A new camera would probably renew my interest. A new photosharing service might also do the trick. I don’t feel as Flickr-friendly as I used to; and no, that isn’t a knee-jerk reaction to the acquisition by Yahoo. As the holidays (and my birthday) approach, it’s time to start thinking what I want in a camera in terms of photo quality, ease of use, portability, price,…or to search for the natural heir to the camera in the photo. Any suggestions? Yahoo has had a bad year. In a week or so, I’ll probably be able to update this post with a link to a timeline (I’m sure someone will do a Yahoo review for 2010). The current month might be labelled the December of dumping Delicious, one of the hot social media properties when we used to call social media Web 2.0. A recent review at Mashable reminds us that Yahoo initially declared Declicious’ status to be “sunset,” then declared it to be for sale, but adds that a sale of Delicious might not be easy or even appropriate. I use Yahoo for two things. One is email. I’d like to be able to get to my Ymail from the Android mail app, but since basic Yahoo mail doesn’t allow straightforward use of IMAP or SMTPs, I have to use the Android browser. I also use Flickr. My Flickr Pro account is one of the few examples of my paying for a freemium service. I’ve been very happy with Flickr, and have not been too annoyed since the Yahoo acquisition. So maybe my Flickr photo for this post about Yahoo is rather snide; or maybe Yahoo is like a precarious, storm-battered shack. But my confidence is Yahoo has sunk below the point at which I can recommend Flickr. It has not yet sunk below the point at which I will use Flickr. As we head into 2011, I’m regretting that each of the two Yahoo services I use is rather sticky. Perhaps it was silly to use an email address with a domain I don’t own (andrew at changingway dot org, now that makes more sense). I have thousands of photos at Flickr, some of which are linked to from this blog and from other sites. Perhaps Yahoo will be the comeback kid of 2011. I don’t see that happening, though. Google acquired Picnik. Liz at GigaOm leads with the fact that this is the latest in a series of deals by which ex-Googlers have been brought back into the fold. I’ve yet to see an answer to my main question about the deal: how will this affect the relationship between Flickr and Picnik? It’s been posed in several places, including the comments on Picnik’s post about the acquisition. When I’m using my Flickr account and click to edit one of my photos, it’s Picnik that starts up. Apart from wishing that it would start up rather faster, I’m happy with Picnik. Around the holidays, and a few other times I year, I want to have some photos on paper as well as on the web. On the web mainly means my Flickr photostream. I’ve used various services (Shutterfly, Snapfish, etc.) for printing, with no clear winner emerging. More recently, I used the Order Prints button that I see above each of my photos at Flickr. I had no complaints about the quality, the price, or the few days wait before the prints arrived. Then, just before the 2009 holiday season, Flickr partnered with Snapfish. It’s perhaps for that reason that square prints are no longer available. That’s bad news since, as you can see, I like to do the occasional crop to square. Another difference came from my need to get prints quickly. The need for speed pushed me toward a Flickr/Snapfish/Walgreens print. Snapfish partners with retailers such as Walgreens on the output (prints) end, just as it partners with Flickr on the input (jpgs) end. So I could pick up prints at a reasonably close Walgreens. The experience with Snapgreens wasn’t bad, but it wasn’t great. I was supposed to get an email when my prints were ready to pick up, but I never did. So I called the store to check, then went to get the prints, and they were fine. They ended up costing a few bucks, rather as if I’d had them mailed rather than driven myself to a store to get them, but that didn’t seem too bad. On the other hand, I’m sure that there are better paths to printing than Flickr/Snapfish/Walgreens. For example, I drove past a CVS or three (or more) on my way to the Walgreens, and I could have just put the jpgs on a USB, stopped in at CVS, and printed the photos. The prints might well have turned out just as well – I didn’t do the experiment. Next time I need photos printed, I think that Ritz Camera will get my business. They have a location a few miles away, and it shares a parking lot with the Trader Joe’s nearest me. I’ve had good service from other Ritz locations in the past. I also admire Ritz as a specialist amidst more generalist big-box (Best Buy) and big-URL (Amazon) competitors. And Ritz do square prints. To be more specific, 6×6 prints, for which I already have some inexpensive frames from IKEA. Having a smarter phone, and hence a more mobile web, is making me rethink multiple aspects of the web and how I use it. For example, I thought of streamlining my use of email. Right now, I have three main email accounts, and am on more than a few distribution lists. I don’t know how many lists I’m on, which strongly suggests that I’m on too many. It might make sense to choose one email, autoforward the others to that mailbox, and get off most or all of the distribution lists. That would give me manageable mobile email. But one of the emails is andrew dot watson at yahoo.com. To autoforward from that mailbox would cost me $20 a year, every year for the forseeable future. In Yahoo’s helpful words: Yahoo! Mail allows you to forward messages that come to your Yahoo! Mail Plus account to another email address. I emphasize Plus because Plus includes forwarding and POP access, whereas basic Yahoo mail does not include these features, basic though they seem to me. I shouldn’t be too hard on Yahoo (especially since I own some shares). It’s not the only site that charges for forwarding. The site that hosts this blog has a similar policy in place if you want to redirect yourblogname.wordpress.com (as well as all of your permalinks) to your new domain name. The WordPress policy is similar to the Yahoo policy, but it’s not identical. It costs $10, rather than $20, a year. That leads me to the following recommendations. For service providers, such as Automattic (owners of WordPress.com) and Yahoo: consider offering a “forward forever” deal. I’d suggest pricing it at twice the cost of one year’s forwarding. That way, the user gets to pay and forget, rather than being reminded every year that they need to keep paying for a service they don’t really us. That would be good for reputation, goodwill, etc. – and for cash flow, in that you’d get money now, rather than in future year. For web service users, especially content creators, think about leaving a service before you think about using that service. This echoes the advice given to firefighters: don’t go into a building without knowing your way out. For web service users again: own your own domain. I’ve taken my own advice here, by owning changingway.org. On the other hand, I don’t own flickr.com, which is where I keep most of my photos (including the one used in this post). But that brings me back to Yahoo, which owns Flickr, and forward to consideration of getting photos out of Flickr and other photo services…. which deserves a separate post. The Boston Public Library is running an exhibition of travel posters. The site of the exhibition is Flickr. The collection spans many destinations, but I find this poster particularly pleasing and appropriate. If you have a new* Flickr Pro account, you can get a free 10-pack of Moo minicards. The image is a minicard-proportioned crop of one of my photos. Feel free to use it, or any of the other minicard crops in my MooMini4U photoset. Even if you don’t have a Flickr account, MOO MiniCards are cool, and you are still welcome to use my crops.